Flicker Alley is proud to present the following essay by BNoirDetour, written for Detectives and Dames: A Flicker Alley Noir Blog-a-Thon! 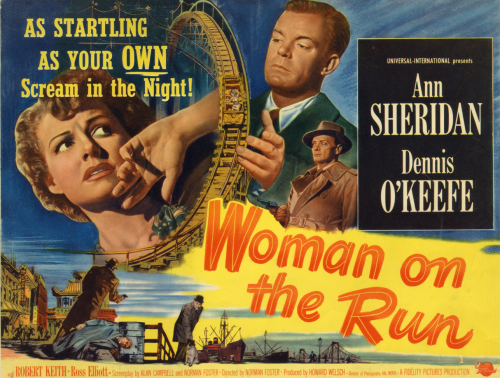 Woman on the Run (1950) is available on Blu-ray/DVD May 10! Pre-order today! Note: This essay contains spoilers for Woman on the Run. Critics are right to note the virgin/whore dichotomy in women’s roles within film noir. The most identifiable female noir characters are the femme fatale and the devoted girlfriend/wife. In the cynical, criminal world of noir, women are generally either ruthless seductresses or innocent maintainers of hearth and home.The femme fatale destroys family; the good wife protects it. Of the two types, feminist critics (e.g. the authors in Women in Film Noir) have tended to emphasize the strong, active role of the femme fatale compared to the more passive girlfriend/wife. Yet the bad girl must be punished as a threat to the traditional gender hierarchy: men lead and women follow. Upsetting this order necessitates condemnation of the gender traitor, so the femme fatale faces penalties from isolation to imprisonment to death. Some women’s roles, of course, do not fit within this narrow binary absolute. Imogen Sarah Smith, in the Winter 2015 issue of Noir City, discusses the noir “working girl,” an active and independent figure nonetheless devoted to men (usually one in particular) based on the Hawksian woman – e.g. Rosalind Russell in His Girl Friday or Ella Raines in Phantom Lady. She reflects well the changing status of white, middle-class women during the WWII era without invoking paranoia of emasculation. Yet such paranoia is central to film noir, as is anxiety over race and nation related to the war. 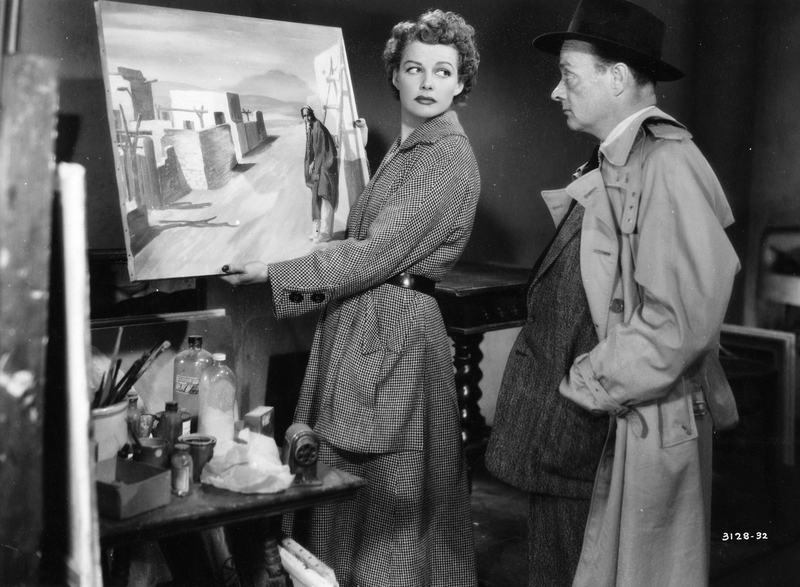 Ann Sheridan and Robert Keith in Woman on the Run. Through her efforts to find Frank and give him the heart medicine he desperately needs, Eleanor eventually comes to see her husband as a man she should love and support but has not. “A lot of it’s my fault,” she admits to Ferris. “I haven’t been much of a wife.” Ferris acknowledges her confession with affectionate condescension, “That’s quite an admission from you, Mrs. J.” But admitting her failure is not enough. This is noir, and although she is no black widow and has not been unfaithful—one wonders if she has any sexual appetite at all, actually—she has been a bad wife and her penance requires stronger measures than an expression of guilt and a few snide remarks from a kind police officer. The scene most praised for its uniqueness in Woman on the Run is the roller coaster ride. The tension is high as Mrs. J rides with the killer beside her up the tracks and down, the fear and guilt she already has heightened by the adrenaline-exhausting circular trip. Then, when she finally realizes who Dan is, she is stuck riding the coaster a second time, full of utter terror and panic as the world spins and dips around her while her husband is stalked by a sociopath. Within the context of gender analysis, can we read this scene otherwise than the ungrateful wife’s deserved punishment? Certainly, she faces a form of torture it is painful to watch. 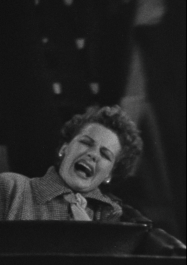 And watch we must, for the camera is centered on her horrified, shattered expression and her body being thrown across the seat like a rag doll. Moreover, once she survives this harrowing ordeal, she hears a gunshot which she assumes kills her husband. Inspector Ferris soon—but not immediately—tells her the man floating limply in the water is not her husband but the murderer. He then tells her where to find Frank. Mrs. J is no femme fatale, but her mistreatment in the film’s climactic moments suggest that her threat to men is just as great. This woman has not shown her husband respect, proper wifely submission, or even the abiding support of a spunky working girl. Only once she has been tormented, both emotionally and physically, can she earn a permanent return to her husband’s loving arms. Ultimately, Woman on the Run can be read as highly reflective of post-war Hollywood as it gives way to the suffocating atmosphere of the 1950s. If we agree with the film’s judgment and join in the punishing of Mrs. J, it is because she is the protagonist whose perspective—written, directed and filmed by men—we are given. Because this offers so bleak a prescription, let me end this post on another note. Note that the husband-wife embrace does not end the picture. 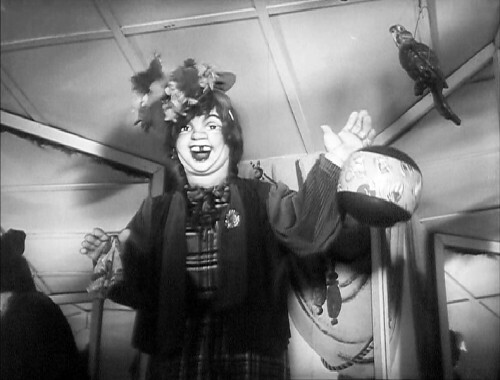 After they clasp one another as strangers encircle them on the midway, the camera retreats, pulling away and then stopping on the figure of a grotesque female mechanical clown that cackles madly to end the film. 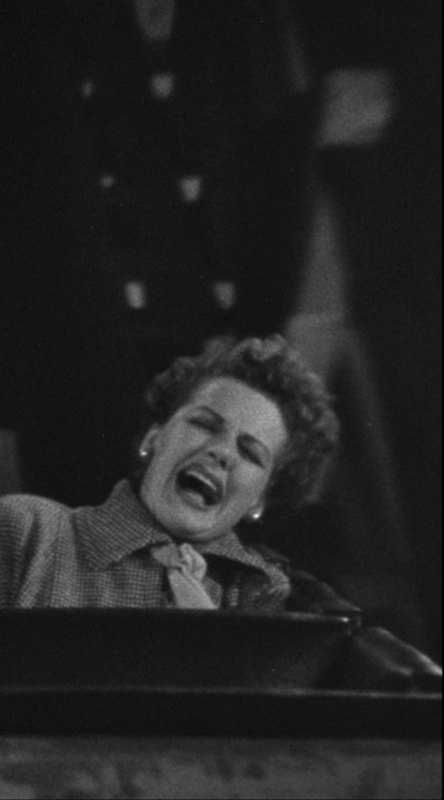 We saw and heard her laughter earlier in the film, especially as Eleanor was whipped about on the ride. Cruel fate mocks us. Yet, to me, this choice for a final image is more specifically suggestive. I find it a welcome carnivalesque moment, a final commentary on the gender roles we have just seen as not only laughably ridiculous but more than a little creepy.